Planetary Collision - Solar System Planets And Moons Section. Spitzer Sees the Aftermath of a Planetary Collision. NASA's Spitzer space telescope has found a dusty ring of material orbiting nearby Vega which was probably the result of a series of protoplanets smashing into each other. Vega is the fifth brightest star in the sky, located only 25 light-years away in the constellation of Lyra. This dust is constantly being blown out by Vega's intense radiation, so it's unlikely that the star has had this much dust for its entire lifetime. Instead, this ring must have been formed recently, perhaps when a Pluto-sized object was pulverized within the last million years or so. Astronomers say a dusty disc swirling around the nearby star Vega is bigger than earlier thought. It was probably caused by collisions of objects, perhaps as big as the planet Pluto, up to 2,000 kilometers (about 1,200 miles) in diameter. NASA's Spitzer space telescope has seen the dusty aftermath of this "run-in." 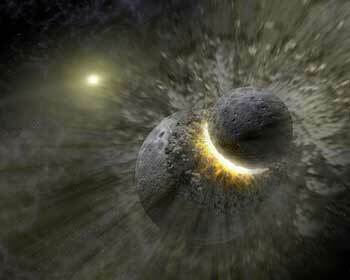 Astronomers think embryonic planets smashed together, shattered into pieces and repeatedly crashed into other fragments to create ever-finer debris. Vega's light heats the debris, and Spitzer's Infrared telescope detects the radiation. Vega, located 25 light-years away in the constellation Lyra, is the fifth brightest star in the night sky. It is 60 times brighter than our sun. Observations of Vega in 1984, with the Infrared Astronomical Satellite, provided the first evidence for dust particles around a typical star. Because of Vega's proximity and because its pole faces Earth, it provides a great opportunity for detailed study of the dust cloud around it. "Vega's debris disc is another piece of evidence demonstrating the evolution of planetary systems is a pretty chaotic process," said lead author of the study, Dr. Kate Su of the University of Arizona, Tucson, Ariz. The findings were presented today at the 205th meeting of the American Astronomical Society in San Diego. Like a drop of ink spreading out in a glass of water, the particles in Vega's dust cloud don't stay close to the star long. "The dust we are seeing in the Spitzer images is being blown out by intense light from the star," Su said. "We are witnessing the aftermath of a relatively recent collision, probably within the last million years," she explained. Scientists say this disc event is short-lived. The majority of the detected material is only a few microns in size, 100 times smaller than a grain of Earth sand. These tiny dust grains leave the system and dissipate into interstellar space on a time scale less than 1,000 years. "But there are so many tiny grains," Su said. "They add up to a total mass equal to one third of the weight of our moon," she said. The mass of these short-lived grains implies a high dust-production rate. The Vega disc would have to have an improbably massive reservoir of planet-building material and collisions to maintain this amount of dust production throughout the star's life (350 million years, 13 times younger than our sun). "We think a transient disc phenomenon is more likely," Su said. Su and her colleagues were struck by other characteristics of Vega's debris disc, including its physical size. It has a radius of at least 815 astronomical units, roughly 20 times larger than our solar system. One astronomical unit is the distance from Earth to the sun, which is 150 million kilometers (93 million miles). A study of the disc's surface brightness indicates the presence of an inner hole at a radius of 86 astronomical units (twice the distance between Pluto and the sun). Large embryonic planets at the edge of this inner hole may have collided to make the rest of the debris around Vega. "Spitzer has obtained the first high spatial-resolution Infrared images of Vega's disc," said Dr. Michael Werner, co-author and project scientist for Spitzer at NASA's Jet Propulsion Laboratory (JPL), Pasadena, Calif. "Its sensitive Infrared detectors have allowed us to see that Vega is surrounded by an enormous disc of debris," he said. JPL manages the Spitzer space telescope mission for NASA's Science Mission Directorate, Washington. Science operations are conducted at the Spitzer Science Center at the California Institute of Technology (Caltech) in Pasadena. JPL is a division of Caltech. The multi-band imaging photometer for Spitzer, which made the new disc observations, was built by Ball Aerospace Corporation, Boulder, Colo.; the University of Arizona; and Boeing North American, Canoga Park, Calif.